Freshwater Pearl Jewelry for the Newborn Baby includding baby pearl bracelets and freshwater pearl baby necklaces. 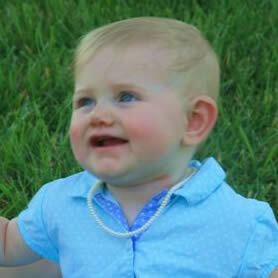 Nothing looks more adorable than a cute little baby wearing her first genuine pearl bracelet or necklace. This pearl jewelry will become an heirloom for generations to come. What a perfect gift for all those special times of the year from Christmas to Hanukkah, birthdays to baptisms. 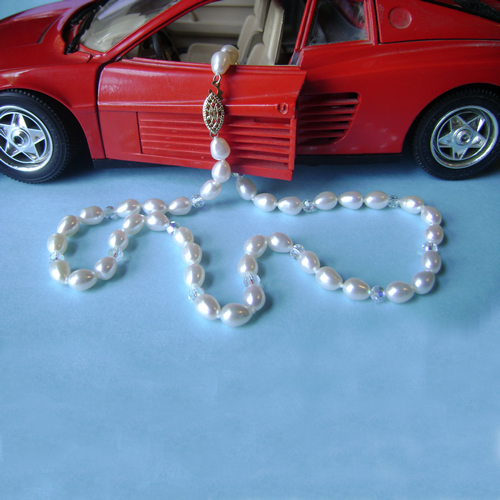 Every little baby girl should never be without her pearls! 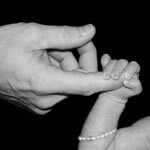 See our Bracelet Length Guide for Newborns. Who says newborn baby girls can not wear pearls? She will look like a little princess in this adorable white 5mm freshwater pearl bracelet with a sterling silver safety pearl clasp for extra security. I have added 4mm white Swarovski crystal spacers in between every fourth pearl for that extra touch of sparkle. The bracelet is designed using the finest white silk thread. 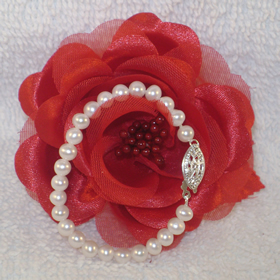 These pearls have a very high luster which makes this bracelet perfect for our newborn baby girls. And remember, you can have the bracelet grow along with your child by simply sending it back to us and having pearls added. What a beautiful way to start an heirloom. Please call for pricing on enlarging the bracelet. This high luster 5mm freshwater potato pearl necklace with white 4mm Swarovski crystal spacers matches her newborn baby bracelet perfectly. 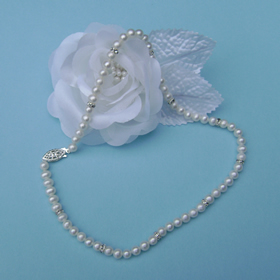 The sterling silver traditional pearl safety clasp gives her necklace that extra security. And like the bracelet, this is designed with the finest silk thread. Also when she grows out of her necklace please send it to me so I can enlarge it for her. Please call for pricing on enlarging the necklace. 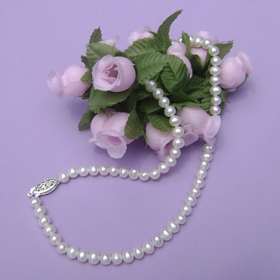 This traditional white freshwater pearl necklace is designed with 5mm potato pearls which have a great luster. The pearl clasp is a sterling silver filigree design with a safety hook for extra security. For that perfect gift of her first strand of pearls this classic necklace will be worn for a long time. 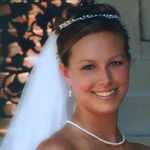 For enlarging the necklace, please call us for pricing. 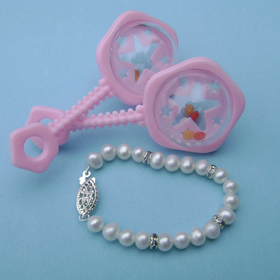 This delightful baby bracelet is made with white 5mm freshwater potato pearls. These A grade pearls have a very high luster making this bracelet beautiful for all skin tones of our newborn babies. The bracelet is complete with a traditional sterling silver filigree pearl safety clasp for extra security. And as with all my pearl jewelry, this bracelet is custom designed using only the finest silk thread.